The TVS Motor Company has launched a new edition of its popular TVS StaR City+ commuter motorcycle. This edition is called the 'Kargil Edition' and is priced at Rs 54,399 (ex-showroom Delhi). As the name suggests, the StaR City+ Kargil Edition is a homage to a soldier's spirit and attitude, which TVS hopes resides in every Indian citizen. The changes to the Kargil edition are purely cosmetic. This gets a white and green dual tone colour scheme with camouflage graphics in white, green and blue. Each bike gets a Kargil emblem on the back too. This design draws inspiration from the terrain of the region and the soldiers who put in their best there. This comes after the Kargil Calling - Ride for the Real Stars initiative with the TVS StaR City+. With this, TVS celebrated the contribution of the Indian Defence Forces on Kargil Vijay Diwas (July 2018) across its 3,500 touchpoints. 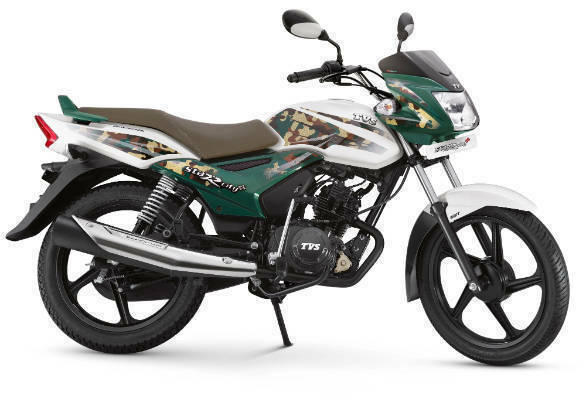 The brand also designed a special Kargil themed TVS StaR City+ to lead the rally in five key markets. The TVS StaR City+ is powered by a single-cylinder air-cooled 110cc motor that makes 8.40PS and 8.70Nm. This is paired with a four-speed gearbox. Fuel economy is 62.5kmpl.